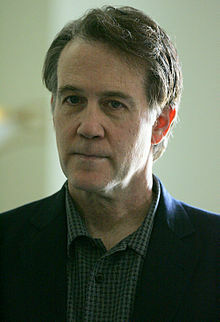 Boyd Payne Gaines (born May 11, 1953) is an American actor. During his career, he has won four Tony Awards and three Drama Desk Awards. He was born in Atlanta, Georgia, to James and Ida Gaines. His early theatre training began at the Pacific Conservatory of the Performing Arts at Allan Hancock College in Santa Maria, California, where his talent and rich baritone voice were showcased in leading roles in plays, musicals, and opera. He attended the Juilliard School as a member of the Drama Division's Group 8 (1975–1979). Gaines has appeared in a number of films and television shows, including Fame, L.A. Law and Law & Order, Piece of Cake (1990), but his most notable television role was as Mark Royer, who married Valerie Bertinelli's Barbara Cooper on TV's One Day at a Time. Gaines appeared in several seasons of the show. He also portrayed Coach Brackett in the 1981 movie Porky's, Lt. Ring in the 1986 film Heartbreak Ridge and Jason in The Sure Thing (1985). Gaines is a voice actor, and is credited with recording several audiobooks. He has appeared on the Broadway stage, in both musicals and plays, for which he has won four Tony Awards. His first Broadway play was The Heidi Chronicles in 1989. Other musicals he appeared in have been Company (1995), She Loves Me (1993), Contact (2000) and the Broadway revival of An Enemy of the People in 2012. Other plays have been The Columnist (2012) and the 2010 revival of Driving Miss Daisy. He appeared in the 2008 revival of Gypsy as Herbie, and won the Tony Award. He has appeared Off-Broadway, starting in 1978 with Spring Awakening and recently The Grand Manner by A. R. Gurney at Lincoln Center in 2010. In regional theatre, Gaines appeared in Our Town at the George Street Playhouse, New Jersey, in April 2014. Gaines was nominated for a Tony Award for Best Performance by a Leading Actor in a Play in 2007, for Journey's End, making him the first actor to be nominated in each of the four Tony categories for which an actor is eligible. Only two male and three female performers have been nominated for all four Tony performance awards, the others being Raúl Esparza, Angela Lansbury, Jan Maxwell, and Audra McDonald. Gaines was the first performer to be nominated for each of Best Featured Actor in a Play in 1989 for The Heidi Chronicles, Best Actor in a Musical in 1994 for She Loves Me, Best Featured Actor in a Musical in 2000 for Contact, and again in 2008 for Gypsy and Best Actor in a Play in 2007 for Journey's End. Gaines won in three of the categories (and four of the five nominations), missing only for the performance in Journey's End. His four wins are for The Heidi Chronicles, She Loves Me, Contact, and Gypsy. He is married to Kathleen McNenny. They have one child. 1984 Hotel Jeff Strider Episode: "Wedding"
1985 MacGruder and Loud Ellis Episode: "Tarnished Blues"
1985 Remington Steele Todd Myerson Episode: "Grappling Steele"
1985 Hotel Steven Parker Episode: "Hearts and Minds"
1986 Hotel Rodger Gage Episode: "Undercurrents"
1988 Spenser: For Hire Alfie Gainer Episode: "Skeletons in the Closet"
1988 American Playhouse Reverend Dobson Episode: "Pigeon Feathers"
1989 The Days and Nights of Molly Dodd Imposter Episode: "Here's a Rough Way to Learn a Foreign Language"
1992 Anything but Love College Professor Episode: "Catherine Honey, I'm Home"
1992 Murder, She Wrote John Halsey Episode: "Programmed for Murder"
1993 Law & Order Lieutenant St. Claire Episode: "Conduct Unbecoming"
1994 Frasier Phil Patterson Episode: "The Candidate"
1995 Law & Order Nathan Barclay Episode: "Wannabe"
1997 Law & Order Oliver Shain Episode: "Matrimony"
1997 Caroline in the City Jerry Episode: "Caroline and the Wayward Husband"
1997 Remember WENN Congressman Bob Farraday Episode: "A Girl Like Maple"
2003 Queens Supreme Steve Simon / Stan Standowski Episode: "Flawed Heroes"
2004 Law & Order James Rillard Episode: "Coming Down Hard"
2009 American Experience Voice of Chairman Gray Episode: "The Trials of J. Robert Oppenheimer"
2009 The Good Wife Richard Chatham Episode: "Home"
2015 American Odyssey Harrison's Father Episode: "Drop King"
2015 Great Performances Boolie Werthan Episode: "Driving Miss Daisy"
^ "Alumni News". Juilliard School. September 2007. Archived from the original on 2011-11-11. ^ "Lincoln Center Theater: The Grand Manner" lct.org; accessed September 16, 2015. "Boyd Gaines Biography". filmreference. 2008. Retrieved 2008-06-09. "Boyd Gaines Audio Books". AudioFile. 2008. Archived from the original on 2010-12-28. Retrieved 2008-06-09.